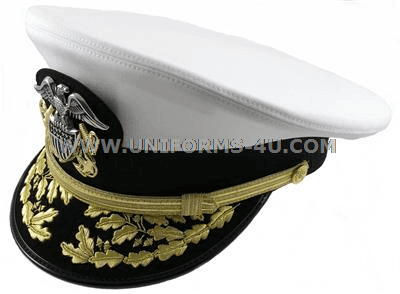 The combination of white, black, silver, and gold makes the Navy’s Combination Cap for Admirals (O-7 to O-10) eye-catching while simultaneously evoking a sense of respect and honor. Twin arcs of oak leaves and acorns embroidered in lustrous gold bullion adorn the visor's left and right sides, perfectly complementing the synthetic gold lacing material used to craft the decorative chin strap. 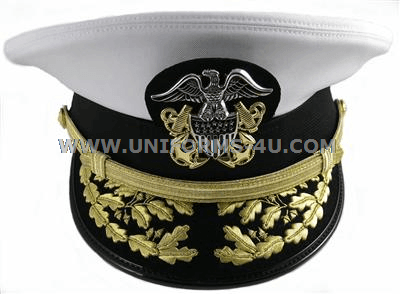 And the Officer cap device’s silver spread eagle, perched atop a shield supported by two golden fouled anchors, is the personification of steadfast watchfulness. This headgear was designated as the Men’s Combination Cover for decades, but with the announced discontinuation of the Female Combination Cover it was designated as a unisex cover along with the newly designed Alternate Combination Cover in 2015. While the announcement of the unisex covers drew protests from female Officers who rightfully noted that they and not their male counterparts would be forced to pay for the new covers with their own funds, their pushback simply extended the wear-out date of the Female Combination Cover until 31 October 2018.